Iran Daily, March 21: Nuclear Talks Adjourn to Next Week — Deadlock or Hope? UPDATE 1930 GMT: US Secretary of State John Kerry is in London to meet British, French, and German Foreign Ministers. We are not rushing…but we recognize that fundamental decisions have to be made now and they don’t get any easier as time goes by. It is time to make hard decisions. Kerry denied stories of divisions among the 5+1 Powers (US, Britain, France, Germany, China, and Russia), with the French demanding a toughening of the deal on the table over both sanctions relief and the duration of an agreement. The Secretary of State declared “unity” among the 5+1. French Foreign Minister Laurent Fabius reportedly phoned his team during this week’s negotiations in Switzerland to ensure that there was no more movement towards Iran’s position. UPDATE 1030 GMT: President Rouhani told reporters on Saturday that “some differences have been removed and new common points of view have been created” in nuclear talks but that other differences remain. The President assured that the remaining issues can be resolved “but it is quite natural that the coming days or weeks will be very tough as taking final step is always somewhat difficult”. He pointed towards compromise, “Negotiations never satisfy both sides completely as each side should mind their own red lines…. The nuclear talks between Iran and the US, joined by the other 5+1 Powers (Britain, France, Germany, and China), have adjourned to next week amid mixed signals over their prospects. The latest discussions ended on Friday in Lausanne in Switzerland after five days of talks, mainly between Iranian and American officials. The two sides are seeking a deal by an informal deadline, set by the US, of March 31 and a formal cut-off of July 1. As Iranian officials returned to Tehran for the Persian New Year and the funeral of President Rouhani’s mother, US Secretary of State John Kerry moved to London, where he will meet counterparts from Britain, France, and Germany on Saturday. Iran’s lead nuclear negotiator, Deputy Foreign Minister Abbas Araqchi, said talks will resume next Wednesday, while American officials envisaged a restart on Thursday. Some officials, including Russia’s Deputy Foreign Minister, maintained that the talks were moving closer to resolution, but others indicated that the two sides were still far apart on the issue of sanctions relief. The 5+1 Powers also are reportedly divided among themselves. Officials said France is demanding a deal which is longer in duration and with more restrictions than that envisaged by the other five countries. 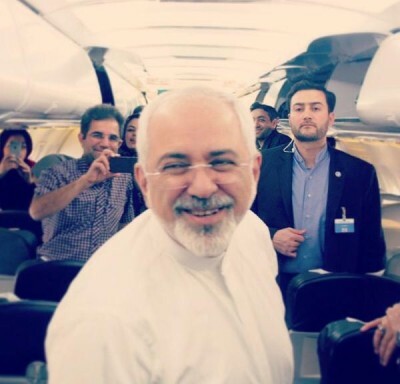 Iranian Foreign Minister Mohammad Javad Zarif had said on Thursday that he would stay in Lausanne “as long as it takes” for a conclusion. 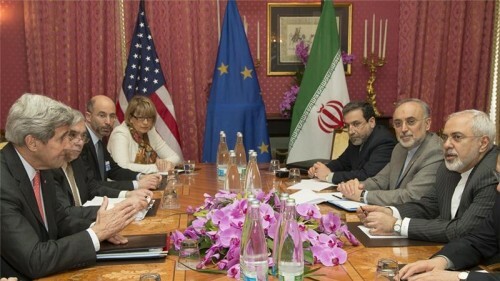 However, the Iranian mood shifted after France raised objections to the deal said to be on the table. Claims circulated that the French wanted the arrangements to be binding for up to 25 years, after Iran had reportedly made concessions from its public position to accept a 10-year duration. The Iranians said on Friday morning that European Foreign Ministers should not come to Lausanne until the 5+1 Powers sorted out their differences. US officials then said that Kerry would meet his colleagues in London rather than Switzerland. Iran’s lead technical negotiator, Ali Akbar Salehi, had said on Monday that “90% of technical issues” had been resolved. The Supreme Leader has designated this Iranian year as “Government and Nation: Solidarity and Harmony”. In his New Year’s message, President Rouhani has implicitly thanked Iranians for their sacrifices during Iran’s economic problems. Rouhani expressed his gratitude for support of the Government during implementation of the “Resistance Economy”, the Supreme Leader’s concept to withstand sanctions and recent difficulties in economic policy. The President promised to increase sustainable development, job opportunities, and non-oil exports in the new year. Rouhani said the pursuit of the Resistance Economy had paved the way “for the victory of Iran’s negotiators against the world powers” in nuclear talks, as the US and its allies had come to realize that “sanctions and threats” are futile.